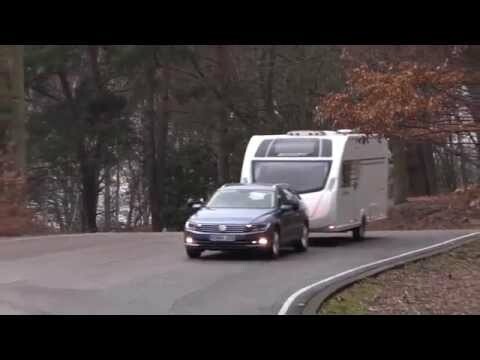 Watch our expert review and find out what tow car ability the VW Passat Estate has. This is the eighth generation of the Volkswagen Passat. The new car is lighter, more economical and safer than before. Despite being a fraction shorter than the old car, it promises more room for passengers and luggage. We’re testing the 150PS 2.0 TDI, which the manufacturer expects to be the most popular engine option. The new VW Passat has a lot to live up to. The previous two generations both won trophies in the Tow Car Awards. We’re keen to see what tow car ability the new car has, whether it picks up where its predecessors left off, with stability at speed and punchy performance from the 150PS engine, and we want to see if the estate is as practical as it seems on paper. Volkswagen hasn’t dropped the ball with the new Passat. It tows as well as the old car, if not better. Kerbweights have been reduced by up to 85kg, but the same is true of most new cars as manufacturers try to improve fuel economy and cut emissions. The lightest VW Passat Estate now weighs just 1485kg. Go for the 150PS (148bhp) 2.0 TDI with the Direct Shift Gearbox (DSG) and it weighs 1541kg. That gives an 85% match figure of 1310kg. The main caravan clubs recommend that a van’s MTPLM should not exceed 85% of the tow car’s kerbweight for stable towing, especially for inexperienced drivers. There are more powerful models, but the 150PS engine packs enough punch for towing. Peak torque of 251lb ft arrives at 1750rpm, and doesn’t waver until 3000rpm. That’s a wide band of pulling power that the DSG ’box makes the most of, changing gear smoothly. We matched the car to a 2015 Sprite Major 4 SB with a mass in running order (MiRO) of 1241kg. The Passat pulled it from 30-60mph in a brisk 13.7 seconds. Whether towing on country lanes or A-roads, threading through town or ploughing up the motorway, the VW Passat takes towing in its stride. Strong winds and heavy rain made for difficult towing during our test but, even in blustery crosswinds, the Passat was unperturbed, happily pulling the caravan at 60mph with little input needed from the driver. The Passat coped comfortably with the emergency lane-change test, too. If you need to change direction in a hurry, the VW is happy to be hustled. It corners with little lean, keeps the van under control and finds plenty of grip, even on a wet surface. Damp conditions lengthen stopping distances, but the 11.9m the Passat needed to stop the outfit from 30mph is a good performance on a wet track. As with its predecessor, this Passat has an electronic parking brake. Not every driver takes to them, but we find they make for reliable and secure stopping on hills. You never have to worry whether the handbrake has been pulled on hard enough. On a 1-in-10 slope, we found that the parking brake held the car and caravan still and released smoothly as we pulled away. The twin-clutch, semi-automatic DSG behaves like a conventional automatic when starting on a hill, so you don’t have to juggle the clutch and throttle. There are other signs that VW has thought about the needs of tow car drivers. For one, the towing electrics are now on the side of the towball rather than tucked up under the bumper, which makes hitching up easier. Another is Trailer Assist (a £465 option), which steers the car as you reverse onto a pitch. If you find reversing a caravan confusing, it’s money well spent, as our Group Editor found out. All told, the Passat is a complete tow car. If it weighed a little more it would be close to perfect. There’s little to complain about when driving the Passat without a caravan in tow, either. It’s capable in just about every way. Our test car was fitted with Dynamic Chassis Control (a £700 option). This varies the suspension between Comfort, Normal and Sport modes. The greatest difference is between Sport and the other two. It makes for a much firmer, more tightly controlled ride, without becoming harsh. We’ve driven cars with the standard suspension, and the regular set-up strikes a good balance between comfort and control. So the DCC is nice to have rather than essential. The variable suspension works in tandem with Driver Profile Selection, a standard feature that alters the steering, throttle response, gearbox and other systems. In Sport, the steering weights up nicely and the throttle is more eager. In Comfort, the wheel is light and easy to turn – ideal for parking. Whichever mode is selected, the Passat is refined and comfortable. There’s some road noise over coarse surfaces, but the engine sounds distant and subdued, with little wind noise. As when towing, the DSG swaps gears smoothly and efficiently. It suits the car well, but the manual gearbox cuts the price by £1600. If we have a complaint, it’s that the stop/start system may act too quickly to turn the engine off and save fuel. Once or twice, there was a moment’s hesitation when the engine died before we had come to a complete halt and were just about to move off again. Otherwise, it’s hard to find serious fault with the way the Passat drives. Volkswagen is pitching the new Passat as a credible contender against prestige cars from the likes of BMW and Mercedes-Benz, as well as mainstream rivals. Nowhere is this more apparent than in the Passat’s cabin. The standard of finish is a cut above most family estate cars. It’s not as luxuriously made as the current Mercedes-Benz C-Class, but the Passat has ample showroom appeal. Where the Passat scores heavily over its upmarket rivals is in matching a quality finish with practicality and space. The fronts seats are comfortable on long drives and adjust every which way, to find a sound driving position. Although the new Passat is shorter overall than the earlier version, the distance between the front and rear wheels has increased by almost 8cm. VW has put this to good use by boosting space for rear-seat passengers. It’s not as roomy as a Škoda Superb Estate, but the Passat has plenty of space for a six-footer to sit behind an equally lanky driver. Air vents between the front seats will keep those in the back cool, and ISOFIX mounting points can secure two child seats. However, because there’s a 4x4 version of the Passat, the transmission tunnel is quite stout, which gets in the way if three passengers travel in the back. Boot space is another area in which the Passat Estate excels. There’s a variable-level boot floor. On the higher setting there’s no load lip to lift items over, and additional storage space under the floor. On the lower setting, there’s one huge space, with a capacity of 650 litres. That’s more than you’ll find in a Ford Mondeo Estate or a Škoda Superb Estate; upmarket rivals don’t even come close. Levers on either side of the tailgate lower the rear seats and increase capacity to 1780 litres. It all adds up to a hugely practical car. We can’t think of a better estate for under £30,000. Compared with mainstream rivals, the Passat’s prices look stiff. A new Mondeo in Titanium trim with a similar engine and gearbox costs around £2000 less. Although the car has only been in showrooms for a few months, dealers are already offering worthwhile discounts, according to our sister magazine What Car?’s research. SE Business spec cars are well equipped, with Bluetooth connectivity, sat-nav and adaptive cruise control included. Running costs should be low. Even with the DSG transmission, official figures promise 62.8mpg on the combined cycle. We achieved 30.4mpg while towing. There should be no worries over safety. Even basic VW Passats have a long list of safety kit, and the four-door Passat has achieved a five-star rating from the crash-test experts at Euro NCAP. After three years and 36,000 miles on the road, What Car? predicts that the Passat will be worth 44% of the original price. That makes the Passat a sound buy, if a relatively expensive one. The Volkswagen Passat Estate is probably the best family estate caravanners can buy for a half-sensible price. We hesitate to be unequivocal until we’ve compared the Passat back-to-back with the new Mondeo but, for now, our money is on the VW. It tows brilliantly. Stability at speed is excellent, and the 150PS 2.0 TDI engine is strong enough to pull any well-matched van. The previous Passat was already an excellent tow car, but the new model has clearly been developed with one eye on the needs of tow car drivers. The electrics are more conveniently positioned, and the clever Trailer Assist system will be useful to anyone who dreads reversing. In solo driving, the Passat continues to impress, especially when equipped with the optional Dynamic Chassis Control. Switching between ‘Sport’, ‘Normal’ and ‘Comfort’ has a noticeable effect on the ride comfort and handling. It means that the VW keeps keen drivers smiling on twisty roads, yet rides badly surfaced roads well, too. The new Passat is better to drive with or without a caravan, but it’s the interior that has received the biggest improvement. There’s much more space, especially for those in the rear seats. The finish is also better, and the boot is class-leading. Fuel economy is very good, especially given our test car’s DSG transmission. It’s not often that we achieve better than 30mpg when towing. The VW Passat costs more than most mainstream rivals, but some things are worth paying extra for.